All Four Love: Is it Summer Yet?! Maybe its because he has a fall birthday and can't get fun outdoorsy toys. Maybe its because we have just as much fun playing with them as C does. Maybe its because he is the first kid and will therefore be spoiled rotten. 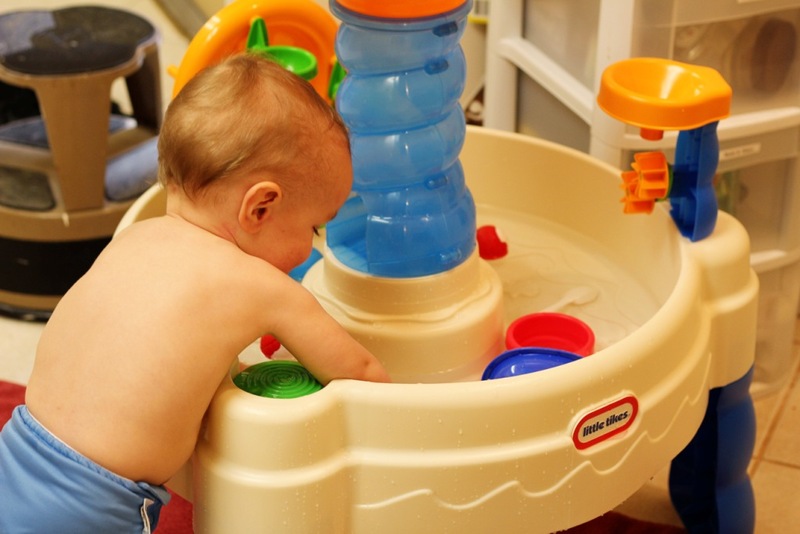 Regardless, C got a snazzy new toy - a water table! We recently did a toy audit around here and sent outgrown toys to consignment, so I felt a little better about bringing a large plastic item home. Coupled with the fact that J will be home with C all summer and they'll need some entertainment, I couldn't resist the sale price of $30. Turns out, it was a wise $30 to spend! 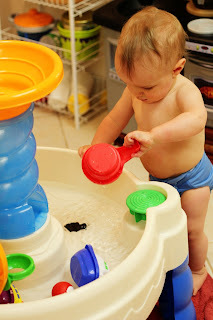 We picked up the Little Tikes Spiraling Seas Waterpark and so far its a hit! It was too cold to set up outside today, but a towel on the kitchen floor and 1/3 of the water you're supposed to use made for one entertained toddler. He only intentionally spilled one cup of water on the floor, but mostly out of curiosity. I can't wait to put this on the back patio and fill it up all the way! It came with five sea animals shaped like balls, a handled cup, and four activities: a spiral slide and a spinning ride for the balls, a wave maker, and a funnel/gear contraption. I was surprised, but even at his short-ish stature (32" give or take a bit) he could easily reach to put the balls in the center slide. I'm not sure how long its going to be on sale, but if you have a Toys R Us near you, its worth checking out. Another awesome sale that I hope continues is their BOGO Little Tikes toys. I picked up a lantern for when we go to camp this summer and a watering can for the garden for whopping $12! Baby toys out, big boy toys in. On a related note, if you're wondering how the rice box turned out, it was an equally big hit! He enjoys scooping and moving the rice from cup to cup. In the picture, he's trying to fill the truck with rice. And yes, some does get on the carpet, but its easy to pick up the piles and vacuum up the rest. I'm *knock on wood* happily surprised how neat he is with it. I'm so happy we're finding interesting and interactive, but not battery operated activities for him. There is nothing wrong with battery operated toys, but he's getting to an age where I want him to explore and be curious, not necessarily just entertained. He still has plenty of noise makers, but its nice to have a balance. P.S. Happy 17 months to my little big boy. I'm quickly realizing that the differences from month to month are getting fewer so monthly updates are getting more repetitive. There will definitely been an update next month for....gulp...a year and a half. Whoa. You can also put the rice into the water table for more indoor fun. We are getting the waterpark for our little guy today!! Thank you so much for posting about it!! Carter LOVES water and I know it will be a big hit!! love this idea! I'm gonna make some rice soon! Want to keep swapping going for April? We picked up the waterpark on Sunday and it was a hit!! I tagged you in my blog about it. Thanks again for the idea! You're welcome! I checked out your pictures - it looks like he had a blast. :-) What a cutie!